Learn how to harness the power of viral marketing with these 6 strategies. "Free" is the most powerful word in a marketer's vocabulary. Most viral marketing programs give away valuable products or services to attract attention. Free e-mail services, free information, free "cool" buttons, free software programs that perform powerful functions but not as much as you get in the "pro" version. Wilson's Second Law of Web Marketing is "The Law of Giving and Selling" (http://www.wilsonweb.com/wmta/basic-principles.htm). "Cheap" or "inexpensive" may generate a wave of interest, but "free" will usually do it much faster. Viral marketers practice delayed gratification. They may not profit today, or tomorrow, but if they can generate a groundswell of interest from something free, they know they will profit "soon and for the rest of their lives" (with apologies to "Casablanca"). Patience, my friends. Free attracts eyeballs. Eyeballs then see other desirable things that you are selling, and, presto! you earn money. Eyeballs bring valuable e-mail addresses, advertising revenue, and e-commerce sales opportunities. Give away something, sell something. Let's put this into practice. I am seeking to promote my newest FREE e-mail marketing newsletter, Doctor Ebiz (http://doctorebiz.com), which discusses Web marketing and e-commerce trends and strategies. I'm using two viral marketing strategies and I'd appreciate your help in testing them, if you're up to an interesting challenge. I'll report results shortly to give you feedback on the effectiveness of these techniques. First, I've placed a Recommend-It button on every page of the DoctorEbiz.com site to encourage visitors to tell a friend about the site. When you go to http://doctorebiz.com please try the Recommend-It button, and then report at http://www.wilsonweb.com/wmt5/ri-report.htm on how effective you think this strategy is. I'll share some of the results and your comments in a subsequent article: "Review: Recommend-It" (http://wilsonweb.com/reviews/recommend-it.htm). Thank you for helping me carry out and then track this marketing exercise. To one degree or another, all successful viral marketing strategies use most of the six principles outlined above. In the next article in this series, "Viral Marketing Techniques the Typical Business Website Can Deploy Now" (http://www.wilsonweb.com/wmt5/viral-deploy.htm), we'll move from theory to practice. 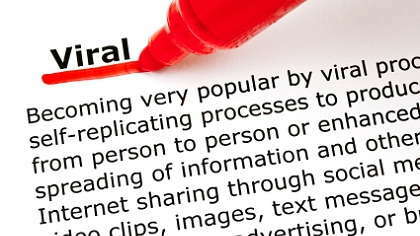 But first learn these six foundational principles of viral marketing. Master them and wealth will flow your direction. Can Viral Marketing Help Your Business?